They showed up for themselves. It was what they believed. It was what they saw as an opportunity to help America become a better version of itself. It was they who wanted to live in a country that reflected their own values and beliefs that inspired them to get on a bus to travel for eight hours to stand in the Washington sun in the middle of August to hear Dr. King speak. Being in Washington was simply one of the things they did to prove what they believed. S*howing up that day was one of the WHATs to their own WHY. * This was a cause and it was their cause. Zero people showed up for Martin Luther King. It was for themselves, it was for the shared belief, the shared dream. It made them feel good. When discussing Tribal Fan the other night, we assembled a list of things that fans do to show their passion and love for their teams. But, they don’t do this for the team. These fans have much in common with those who showed up to watch MLK’s speech. They do this for themselves. They do it to prove how much of a fan they are. 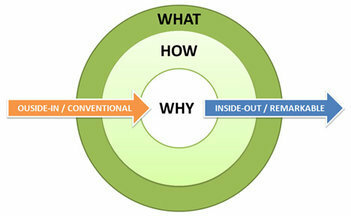 Before building a product or starting a movement, you must consider your WHY and your customers’ WHY.